Get the vital basics of cardiovascular care, with the expert direction and clear-cut images of the freshly updated Cardiovascular Care Made Incredibly Visual!™, 3rd Edition. Let this colorful, down-to-earth text guide you smoothly through essential skills, concepts, and equipment how-to’s, including physical assessments, diagnostic tests, cardiac monitoring, and handling emergencies and complications. 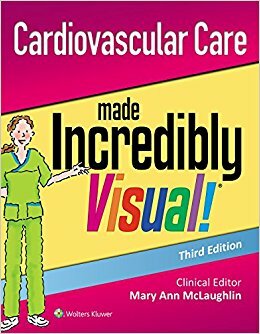 Get ready for success in both the classroom and with patient care; the clear explanations, Incredibly Visual™ humor, and numerous illustrations make this the enjoyable way to learn positive, effective cardiac care. Mary Ann Siciliano McLaughlin EdD, RN, is Assistant Professor and Program Director of the Accelerated BSN Program at Gwynedd Mercy University, Philadelphia, Pennsylvania.